Earlier this year, Chicago-based Little League coach Bob Muzikowski took Paramount Pictures to court in a futile effort to block the release of Hardball, a movie about a baseball team for boys set in the Windy City’s housing projects — and it’s not hard to see why. The film revolves around a compulsive gambler with a drinking problem, played by Keanu Reeves, who reluctantly coaches an inner-city team to pay off his debts, and every single adult member of the league who crosses his path is a jerk. The investment banker who supports the team financially is a cynical yuppie who talks, insincerely, about the importance of giving back to the community, while the other coaches and league officials are portrayed as humourless legalists who exploit the rules to suit their own purposes. The banker also tricks the Reeves character into coaching the team on his own, apparently without any concern for the negative effect a drunk gambler might have on the kids. But this is a movie, and despite his personal problems, and despite the fact that we never actually see him teach the kids how to play ball, the Reeves character rises to the occasion and inspires the team, just by showing up. To those who put a lot of time and effort into coaching Little League teams in real life, the film’s skewed, simplistic perspective — which, in true Hollywood fashion, glorifies the rebellious outsider — must seem more than a little insulting. Muzikowski, who co-founded the real-life league that the film is based on, says he wants to set the record straight in his just-published autiobiography, Safe at Home; he also plans to donate his royalties to various urban charities. Muzikowski himself was an alcoholic and a cocaine addict before he became a Christian, and he began working with inner-city kids sometime later. The book is at its best when it deals with his working-class childhood in Bayonne, New Jersey, and the chapters on his work in Chicago are also quite challenging. But he doesn’t shed much light, if any, on his sometimes controversial partnership with league co-founder Al Carter, who went on to start another league. 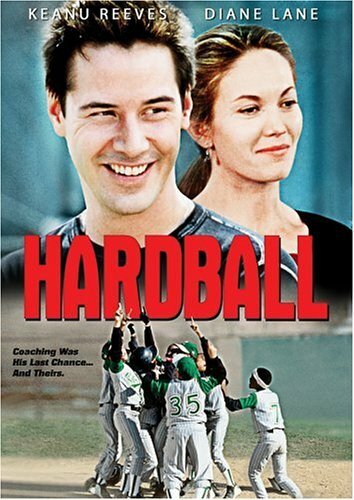 Muzikowski has several bones to pick with the movie, which was based on Hardball: A Season in the Projects, a 1994 book by Daniel Coyle, one of the league’s former assistant coaches. Muzikowski says Coyle (who he never mentions by name) and other reporters have consistently exaggerated racial tensions between the coaches, and he also takes issue with the profanity spoken by the children in the film, which he says is unrealistic and racist on the part of the white filmmakers. However, while it’s true that virtually all of the swearing in Coyle’s book comes from the adults, including Muzikowski, and not the kids, there is nothing new or racist about children cussing on the big screen; little-league athletes have used salty language ever since The Bad News Bears. Plus, Muzikowski himself admits to being amused when one of the league’s umpires greeted former vice-president Dan Quayle with crude, vulgar “street terms”. The difference between the movie and real life is probably summed up best by comparing one scene in the film with a similar incident in the book. In the film, the Reeves character takes his kids to a professional baseball game, hoping it will inspire them. The music swells with bogus pride, fuzzy haloes descend on baseball hero Sammy Sosa as he smiles at the kids from a distance, and in the next scene, Reeves says his plan worked — since going to the stadium, his team has won three games in a row, just like that. The irony and unpredictability of this real-life incident are far more compelling than the film’s phony sentiments, and so is the implicit lesson, that earthly heroes will often let us down. Muzikowski can’t help engaging in a bit of hero worship himself, as he marvels at the good things done by his fellow coaches and ministers, but for the most part, his book offers an important corrective to the Hollywood cliches.